This is certainly making new records for the Longest Running Bag Project Ever. 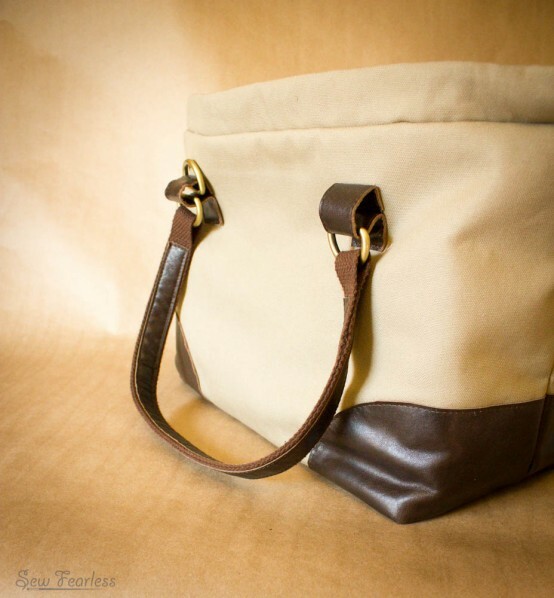 It’s just another Mommy Poppins Bag, but “man-ified”, with a canvas exterior and me-made leather straps. The thing was… the canvas was just. so. pristine. I found some Otterwax – a 100% natural waterproofing treatment for fabrics. 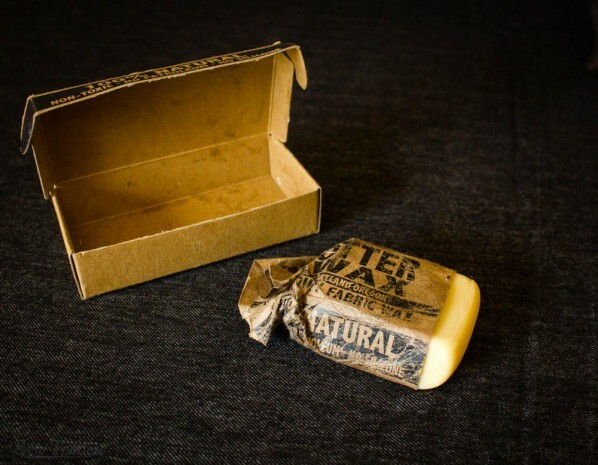 Otterwax has crazy manly packaging! Only uber-manly things could possibly come from packaging this earthy looking. 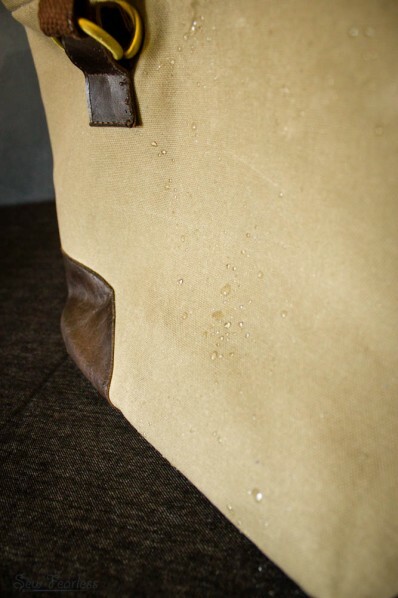 Otterwax is rubbed into, then absorbed by the fabric to give the fabric its waterproofing qualities. It’s not super complicated to do (you can watch how in their instructional videos), but it took me four rounds of waxing to figure out that this thirsty canvas needed the wax smeared on thick. The fabric is wet looking and sticky and slimy when wax is first applied. After the 24 hour “curing” process, after the wax has had a chance to be absorbed into the fibers, the wet and sticky-ness goes down a bit, but completely. With the wax coating the surface of the fabric, it looks as would be expected for “waxed denim” clothing, slick and leathery. 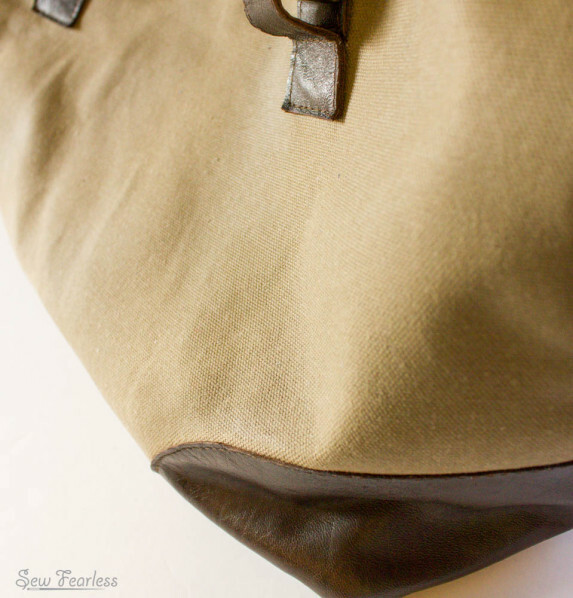 It is not really a texture that works real well for a bag, that will be rubbing against clothing and such. To help with the curing process, I heated up the applied wax with a blow dryer. As the wax heated up, it melted and the canvas absorbed it. The canvas still has a slight sheen to it, and a stiffness from the wax in the fibers. It deepened the color of the canvas and “distressed” it. (In the picture below, the original fabric is on the left, and the treated canvas on the right.) More importantly, with the wax absorbed within the canvas, no more slimy or stickiness! Yes, it is waterproof too, just as promised. 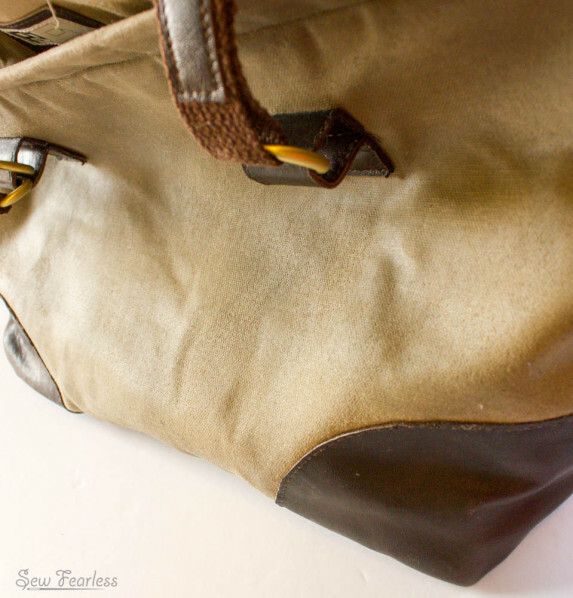 This completes the exterior of the “Manly Poppins” bag. I’ve got a fun idea for the interior that I am excited to share. Or I will be excited to share after I, you know, finish sewing it… in another 3 months or so, or whenever my children stop demanding Halloween costumes of me. Did you wax the fabric before you cut it out and sewed the bag? Or after the bag was made? I like this idea. It keeps the wax out of your sewing machine’s internals, and it lets you get a good dose of wax right into a seam or any area that you identify as a stress point. Can’t wait to see how it ends up! I have been wondering about waxing my own fabric for a while now but didn’t know where to get the wax. Thanks for this post and explanation 🙂 Great looking bag too!! This is fantastic. I love your bag and I love this process. Thanks for sharing. I love the waxing… I’ve spray-waterproofed things before but this is way better. 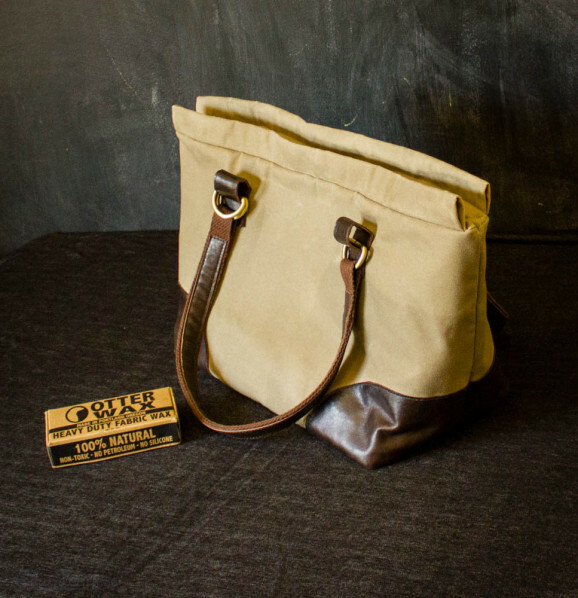 Love the way the bag is looking too, very manly. This is fabulous–I’ve loved the look of the Mommy Poppins since I first saw it, and this makes it even better. Random question though. I’ve been trolling your archives today and notice that you’re a babywearer as well as awesome pattern designer. How do you carry your child and your bag? I prefer wraps and soft structured carriers (like a Moby) to keep the weight on both my shoulders, but if I carry my bag on one shoulder, it often falls off because of the carrier straps, and if I attempt to wear it cross-body, well, it just looks awkward/squishes the baby! Wondered whether you had any thoughts/insights. 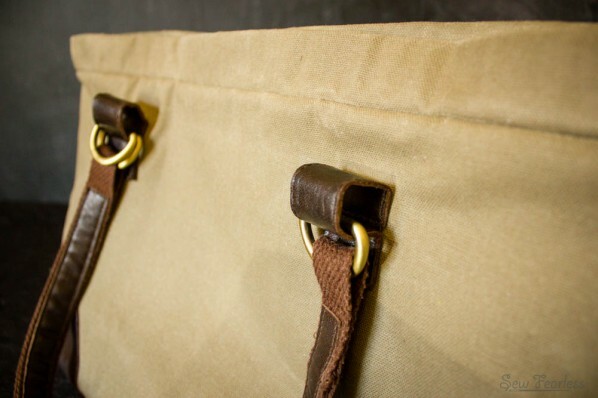 I typically use the soft structured carriers at home, and either a sling or a double stroller out and about. I find that I can arrange a cross body strap around the baby so it works. I love this bag and am already making plans. I’m wondering where you get the closing hardware and where you managed to find the canvas strips for the handles. I love how you’ve sewn leather to it.